Convert DVD to iPhone (including iPhone 3G) on Mac with various practical features. DVD to iPhone converter for Mac is a specially designed mac dvd to iPhone converter. It can convert DVD to iPhone MP4 video on Mac with the resolution for 640 by 480 and also convert DVD to iPhone audio formats like M4A on your Mac directly. 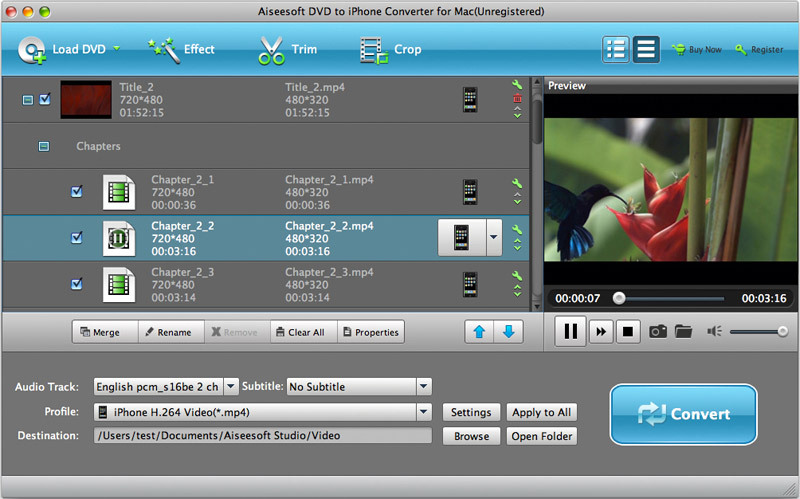 A professional dvd to iPhone (iPhone 2.0) converter developed only for Mac PowerPC and Intel users. Apart from converting DVD to iPhone 3G supported video files, DVD to iPhone Converter for Mac also converts DVD audio to M4A for playback on your iPhone and other players. Crop your DVD video to remove the video sides and enjoy movies on iPhone in full screen. DVD to iPhone for Mac allows you to merge and convert all the titles or chapters you want to convert into one file. Convert DVD to iPhone with any available language on DVD by selecting the subtitle and audio track you prefer. Provide you with real time preview to adjust the output quality. DVD to iPhone Converter for Mac has a very simple Mac-style interface that guides you to convert DVD movies to iPhone without the hassle of figuring out how to use the program. Why Choose DVD to iPhone Converter for Mac?